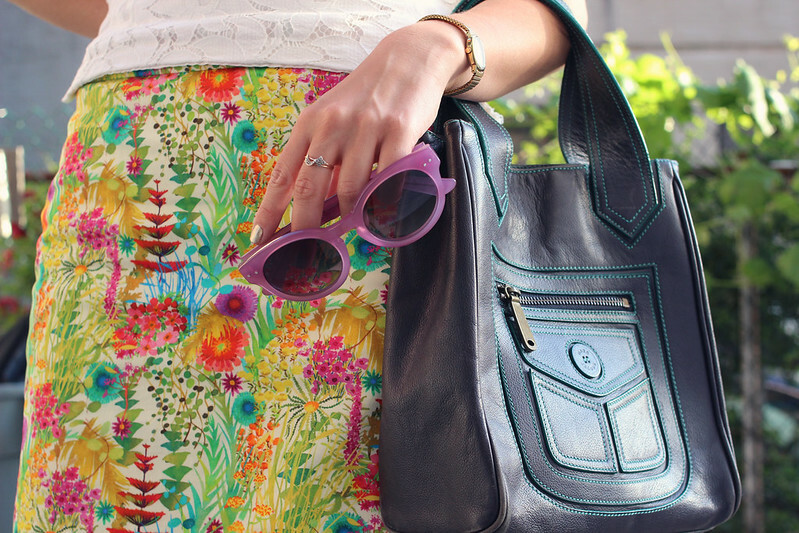 This is my most beautiful skirt, its from JCrew and Liberty of London's spring collaboration and I am in love with it. The fabric is a work of art, beautiful water colored flowers in brilliant colors on a smart office-appropriate piece. I'm always whining about how hard it is to find work clothes, but lately I just make a beeline for the JCrew sale rack and know that I'll find just what I was missing. I paired it with the vintage shell from the Brimfield Antique Fair a few weeks ago and was my lucky find and only purchase. It buttons up the back and has neat little grosgrain bowtie, a collar with an intricate trim and fits like a dream. After eyeing up about 20 tops similar to this on on Etsy, it was fate to find one that seemed made just for me. You look so great in that skirt! It is definitely a work of art - I can't get over the beautiful pattern and the vivid colors. Perfect for summer. I love your shoes! And that skirt is just great!,I'm really love the print. Oooh, neat! That skirt is really gorgeous indeed! I think I should check out JCrew some more. It's a nice outfit, fit for warmer weather without being tacky. Just lovely! I love it! So perfect for work and even if you are doing something after! Seriously, can you stop looking so fab? You make me hate my life. The Hepcat shades are great, I've been wanting a pair as well! Thanks! JCrew drives me nuts bc its obviously too expensive but they send out sale emails like once a week and paired w already-on-sale items it makes it SO much better! OY VEY. So busy. Plz come to NY! I have a pull out with your name on it. This skirt is gorgeous and the top is a perfect match! Those sunglasses are the best ever! They look so perfect with the colorful pattern on your skirt.